Visit Maplocator.com today for examples of communities and Chambers of Commerce where we have produced highly effective and accurate cartography of the region. 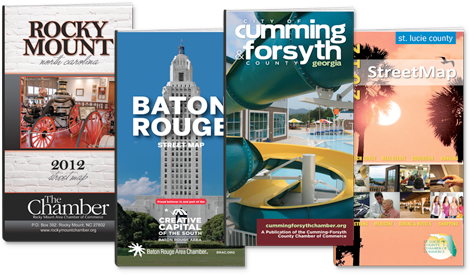 Maplocator is the online counterpart to our printed Street Map & Resource Guide. It is linked from the chamber or city website and offers the participating business added exposure at no extra cost. 98% of the projects we do include maplocator, however some do not and there are some which include it but may not be linked from the chamber or city’s website. Always check the details sheet for the project so you know before you start pitching it. Comes free to all participants! Includes exact cartography as the printed map and will be the most up to date map of the area. Pan and Zoom capabilities allows the end user to drag the map and zoom in to street level detail. All participating businesses are recommended by category and also listed alphabetically by company name. By clicking the business name, it will zoom in and pinpoint the location, feature the company’s contact information (name, address, and phone) and a direct link back to their website.